WordPress is an open source content management system, initially developed as a blogging platform for both personal and commercial use. Popular due to its ease of use, quick install process, flexibility to easily customize and ‘plugin’ new features, WordPress is backed up by a large support community which has driven it’s development and continued success. 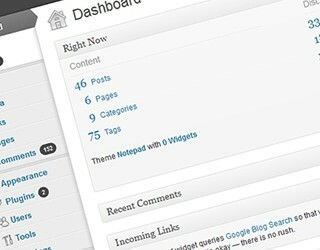 WordPress offers many key benefits every business needs in todays constantly changing environment. As an open source content management system that’s free* for both personal and commercial use, WordPress gives small and medium sized business the ability to launch professionally built websites with minimal time and expense. When help is required, the open nature of the platform and the enormous developer and designer community mean that businesses need never worry about having a website that is bespoke and can only be maintained or developed by a handful of developers. There are two main options with WordPress. There is WordPress.com which is ideal for basic blogging but lacks some of the functionality available with a self-hosted installation. More commonly, businesses will use WordPress.org which allows for custom plugins and themes to be used to build a truly bespoke and functional site. These installations need to be hosted on a file server (there are numerous providers of suitable hosted server space). WordPress is a blog, right? It can be but it’s far more too. WordPress is increasingly being used to build very complex sites, including by UK government, by large international organisations and by news sites like the New York Times. The platform is ideal for small businesses due to the flexibility and freedom but it will also scale as your business grows and your requirements may become more complex. WordPress.org is a free script* and you can get started with a self-hosted installation for very little cost. Attend one of our courses and leave with a fully functional site of your own, installed on our servers free of charge for 3 months. If you wish to keep your site with us after that period we will levy a competitive charge (£10.99 for ProBusiness package including unlimited storage space for your site). Alternatively, you can export your site to another service provider. * Some optional plugins and premium themes do carry a charge.